Clearly reused art from Omega Defender but damn that’s powerful. 4/5 for 4 is vanilla. 4/5 with Mech tag is probably fair for a class card. On top of a fair class card you get a great late game utility?!? Great card. Will see a ton of play. Hopefully this is insanely rare in arena, because it's way too strong there. Otherwise, great tool for different variation of warrior decks. The possibility of getting this off Omega Assembly will mean you don't have to run 2, or perhaps any. cheep Crowd Roaster with no dragon requirement. Might be playable if control warrior should be a thing. This is almost every bit as good as Dyn-o-Matic, and that card is basically a warrior staple. They're obviously different cards, but I think you can see where I'm going here. That's the point. Boom brought Omega Defender with him. 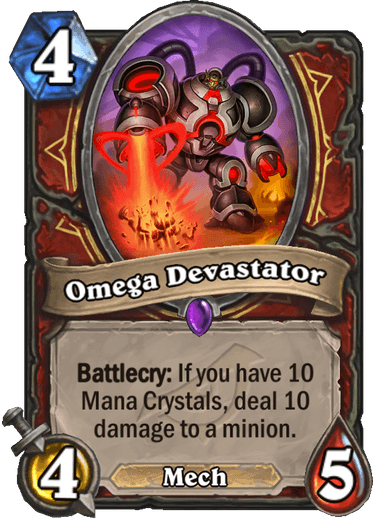 And Omega Assembly is played in just about every warrior deck. OP. Not going to say anything else. And the fact that Dr. Boom, Mad Genius/Omega Assembly can generate it, makes it ridiculous. At the worst, it is just a Yeti. At its best, it is a yeti and it kills something. Overall, it is a great card. Well, in this game, even a great card like this may not get a deck slot... so I don't know. Omega Agent is stronger than this and doesn't see play. But this definitely makes Omega Assembly and Boom's Hero Power stronger. Extremely good card. It's perfectly playable 4-drop in situations where you need that, and in the lategame it becomes essentially a pre-nerf Big Game Hunter, or a much less conditional and more cost efficient The Black Knight. A staple in any control warrior deck, and probably good enough in some midrange decks; especially if they care about the mech tag. Okay that’s a fair point. I forgot about Assembly, and this does curve well late game after playing Mad Genuis. Really good cards haven't seen play since ungoro. Only stupidly broken build around cards, and then whatever cards with synergy. But if the power level is lower, could be a great removal option. The other question...what are going to be the big bodies? Because this isn't enough to kill any of the many 4/12 dragons. If the big bodies are mostly 12's this won't see play. If there is a card like lich King that is every decks big drop, then I can see this being great. Omega Agent's problem is that there wasn't ever a home for her. 3x 4/5 doesn't mean much of anything at the end of the game. And hand buff warlock never materialized. There is an obvious home for this in any control warrior. Destroying (virtually) any minion is incredibly useful at the end of the game. Slap a zilliax onto that bad boy and your opponent will have some serious trouble. Omega Agent is neither stronger nor comparable to this. This card is way better than Crowd Roaster and that card is in multiple different tier 1/2 decks. Dead card in hand for the first 9 turns, very much overrated from what I read in the comments, like all the omega cards before. Although the vanilla stats are better than Omega Agent which is the best omega card and sees a bit of play (much more post rotation I expect), so yeah it's a decent removal tool, but warrior is never short on removals. Obviously this would see play in a mech Warrior list. I'm just saying, in any other deck, this is pretty average/low power. I guess brawl + this is a nice combo. that card is insane and it is unfair to say that omega cards never saw play, so this one will be the same. the omega warlock card has a weak body for a turn 5 and didnt have a deck to be played with... i mean, warlock was about cube or zoo... there was no space for it.